Lawrence Fletcher gets hit with Rodney's evil-izer while Candace mistakes Mom's junk sculpture for the work of Fineas and Ferb. Executive: Brilliant! 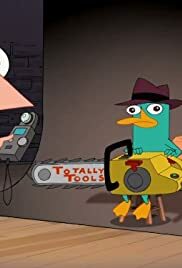 Nothing says Totally Tools like a platypus in a fedora.